This Summer is a real Summer. We’re currently having yet another heat wave (the fourth and strongest this season), with temperatures of 38°C (100.4°F) and we’re just looking for ways to keep cool. Cooking? No, thanks. Salads, smoothies, and fruits are our best friend. Doing anything? As long as it’s under the AC. 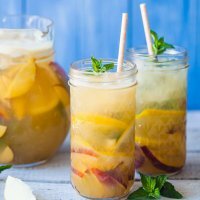 We’re drinking plenty to keep hydrated and one of our favorite drinks these days is this colorful and delicious Summer Peach Lemonade. Take advantage of the short peach season before it is over to make this pretty drink. 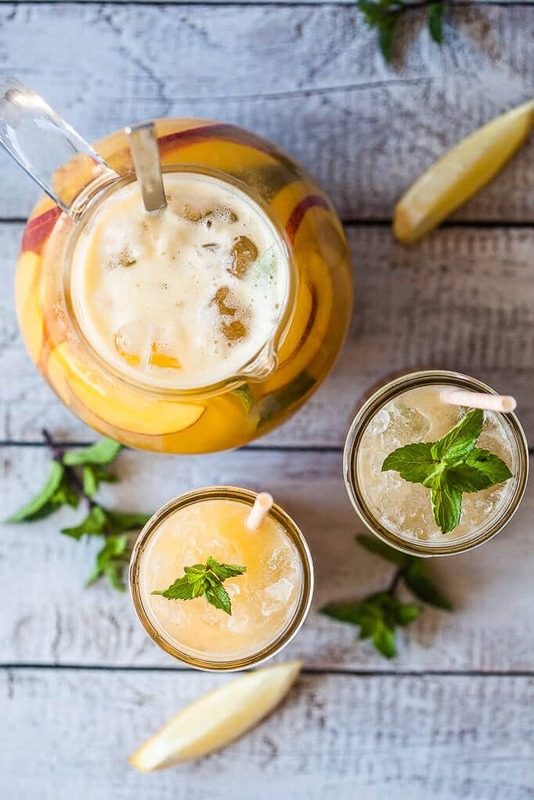 Just peaches, lemons, mint and plenty of water and ice! 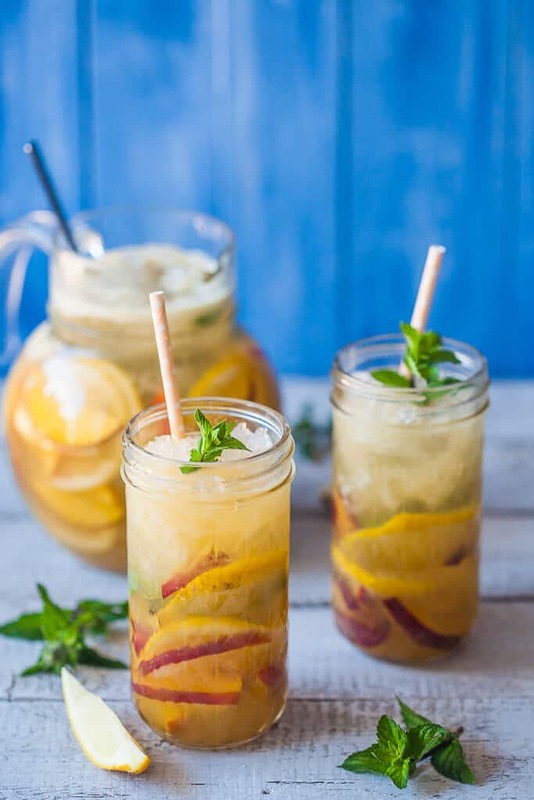 This Summer Peach Lemonade packs a powerful peach and mint flavor and is very refreshing. Just the sort of drink you need after a half an hour car ride in the afternoon, right? Anyway, in this heat, I’m just dreaming of vacations and the sea. We live about an hour’s ride from the sea, but in high season the streets are so packed with cars it’s a nightmare to go anywhere. We haven’t been on vacation just yet, as we’re waiting for the high season to end and the tourists to return home, so we can enjoy our time off in less crowd and lower temperatures that are not pure torture. Have you been on holidays yet? What’s your perfect vacation spot? I’m looking for fresh ideas this year, preferably in Europe! Any recommendations are welcome 🙂 And now I’m off to make another pitcher of this tasty Lemonade! 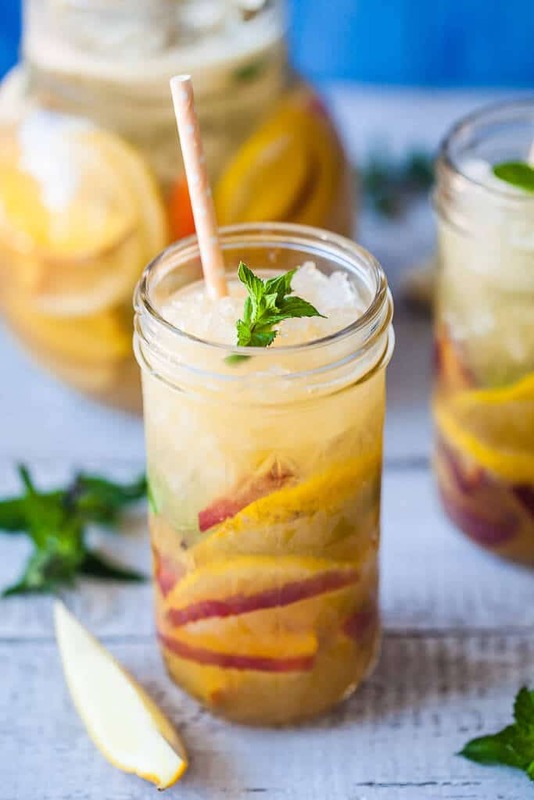 Summer Peach Lemonade has no added sugars and is the perfect drink to keep you cool this summer. Peel and slice 2 peaches, remove pit, and place slices into a blender. Blend until smooth, then pour through a strainer to clear the juice. Pour juice into a pitcher. Cut 2 lemons in half and strain the juice. Add juice to pitcher. Add fresh mint leaves and pour over soda water and regular water. Stir well to combine. 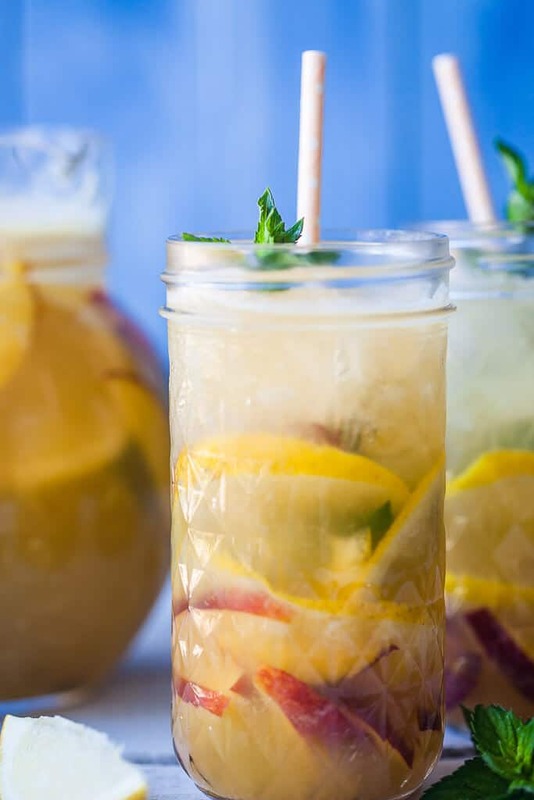 Add lemon and peach slices to pitcher. Place ice cubes into a blender and pulse a few times to crush ice. Add crushed ice to pitcher, stir and serve.